The part of artificial intelligence that we find the most promising is applications designed to improve the lives of people who have disabilities. It’s not easy to find #TechForGood that presents a strong business case but disability AI (sometimes called “assistive AI”) is one of those areas. How will we service 1 Billion People with Future Care Needs? The need for technology to assist the aging population will be massive – it already is but we just haven’t built what the aging population needs yet. We think it goes without saying that any well-built, useful, reliable technology targeted at the aging population will be a lucrative business line. The aging of the population is unprecedented in the history of humanity. Statisticians projected that by 2050, the number of older persons would exceed the number of young people but in Canada, that happened in 2016 and has already happened in many other developed countries. The aging population is also enduring, meaning that the proportion of older persons is increasing, not decreasing. In pure numbers, there will 1 billion people over the age of 60 in about eight years. Moreover, the dependency ratio, which measures how dependent a population is, will climb to the mid-70s, meaning that significant portions of the population will be dependent. The reality is that we will not have the economic resources globally to pay for the dependency factor coupled with a billion people who are part of the aging population – we need smart technology and we need it in a hurry. But its not just the aging population that have disability needs – 20% of the population globally has a disability. In such places as Iraq, Yemen and Syria, the percentage is much higher as a result of war injuries, and many of the disabled are children. 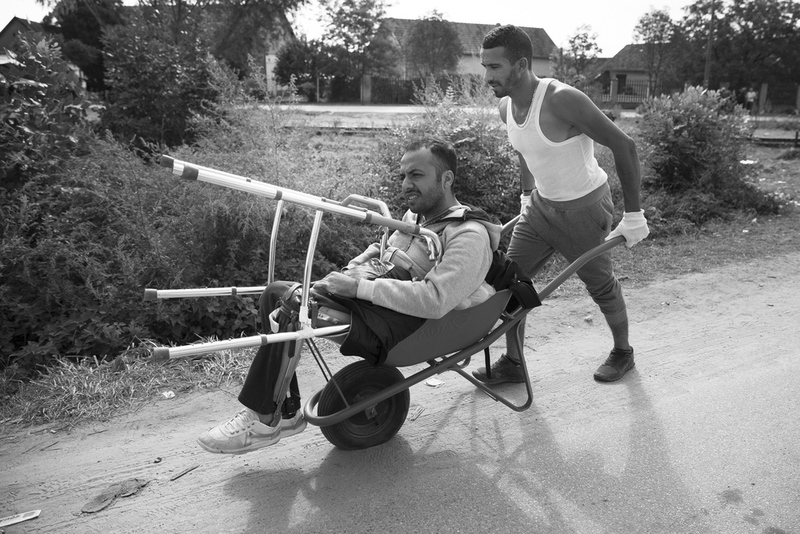 There are over 500,000 people in Syria alone who have physical disabilities and need a range of devices from crutches, wheelchairs or prosthetic devices. Among the aging population, some disabilities happen naturally such as loss of vision and others are elective, such as knee replacements. Knee replacements are debilitating and patients must learn how to walk again – a hard task for an aging person with poor muscle development. Many knee replacement patients never learn to walk again properly. A person will pay any amount of money for technology that allows them to walk again the way they used to. Rather than resorting to canes and walkers, a knee replacement patient, or elderly person, could in the future wear an exoskeleton that has machine learning capability and responds to anticipatory movements of the body to help a person stand up, walk or go up stairs after a joint replacement. Exoskeletons are being tested that are wearable that would help in this area. Exoskeletons are also being tested on patients who are paraplegic, helping them with assistive walking and providing mobility, and ergo some freedom many of them have not had for years. Wearable robotics will have AI that will be able to learn from its owners and improve over time, so that the delivery of support can be more tailored to needs of the disabled person who owns it. Companies in Japan and the US are developing exoskeletons, and some are in advanced stages. 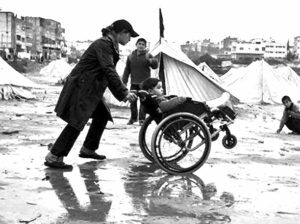 Hundreds of thousands of children are emerging from the refugee crisis with crippling disabilities which prevent them from having mobility, leading a normal life including going to schools in the Middle East. Exoskeletons that are worn under their clothes could enable many of them to return to school and let them do it in a way that provides dignity. But disabilities are not just physical and not just about mobility. Serious illnesses are debilitating, as is impaired vision for people. An interesting development for visual impairment is from Samsung, which is considering developing a smart watch with a screen that projects onto a user’s hand, arm or a large surface. [ii] It could be used for the elderly who gradually lose eyesight to provide visibility via a wearable. Social robots is another area where there is some interesting developments. Iran established a social robotics research laboratory at the Sharif University to develop #techforgood in the form of social robots to serve schools, rehabilitation centers and the sick and elderly. For children with life threatening illnesses like cancer who have to be hospitalized for long periods of time, robots can be used as companions. Studies show that children who undergo cancer treatments often suffer from depression, aggressive behavior and lack of appetite. In a university study, children with cancer who were kept company by Mina or Nima were less likely to show aggressive behavior, fear or be depressed in connection with chemotherapy treatments. During the study period, the robots accompanied children in cancer wards, and entertained them by telling stories, jokes and performing Iranian dances. The study also showed that the children with cancer who had time with robots ate and slept better during their treatments than children who were not given time with one of the robots. Besides robots that machine learn, AI is also being used for oncology research. The global cancer burden is expected to double to 21.4 million cases by 2030. The National Cancer Centre of Japan and the National Intsitute of Advanced Industrial Science and Technology of Japan are developing AI for cancer diagnosis and treatment, drawing from a massive database of genetic information, blood testing results and diagnostic imaging to detect cancer at the early stages and help develop tailored treatment plans for patients. In China, Baidu partnered with a medical school to conduct research using AI on esophageal cancer, which has 50% of the global cases of that type of cancer. The research aims to detect and prevent the disease in China. The CEO of Baidu, Robin Li, personally donated $4.5 million to the project. To fulfil the promise of advanced technology that is AI-driven and uber connected (since it must be connected to users’ mobile phones to continually machine learn and serve customers, corporations and governments alike), countries will have to have high speed universal Internet access. The ability of a country to lead in disability AI (in fact any AI that is consumer facing, including autonomous vehicles), is directly dependent upon its Internet capabilities on mobile devices and on mobile data usage affordability. If we look at Internet penetration, the top countries are Iceland, Norway, Denmark, Netherlands, Finland, UK, Qatar, UAE, Bahrain, Japan. If we look at speed, the top countries are Korea, Sweden, Norway, Japan, Netherlands, Hong Kong, Finland, Denmark. And if we look at mobile data usage, which is key, we find that Finland leads the world in mobile data usage. Other top countries are Korea, Sweden, Austria and Denmark. In China, more than 500 million people are connected to 4G and its government says every family in urban China now has access to the 100Mbps optical network. Canada leads in the opposite, namely with the most expensive mobile data in the world, coupled with low mobile data usage. Growth of mobile usage is faster in countries with high usage where operators have affordable mobile data plans. As a result, countries that have unaffordable mobile data for consumers are hurting their own innovation development because it results in lower Internet penetration and lower mobile data usage. The IoT and AI connected world of the future cannot work in countries that make mobile data usage unaffordable for millions of people. Having a disability is a hard road to travel for children and the aged population alike. For people with a disability or debilitating disease like cancer, AI and robotics hold the promise of better outcomes with technology that can deliver dignity as well as life-saving solutions. We need to quit funding useless tech that serves no utility in the grand scheme of things, and instead look to the future with investments in AI technology that solve real world problems that can improve the lives of all of us. People and governments need to be a lot smarter on where they invest and develop tech, because the reality is that creating technology that serves 1 billion people isn’t going to be hard on anyone’s bank account. [i] United Nations population statistics. [ii] The Verge, “Samsung imagines smartwatch that projects a screen onto your hand”, May 13, 2016. [iii] CEDRA, اتوماسیون و رباتیک طراحی علمی‌ قطب, “زمایشی‌ و شناختی رباتیک پژوهشی ‌ آزمایشگاه اندازی راه “.